France's yellow-vest protest movement is in part a reaction to globalization and multilateralism. Discontent with globalization is a key factor behind the temptation to advance policy goals through unilateral actions rather than by working together. Notwithstanding the major net positive impact of economic globalization on worldwide prosperity and diversity, recent decades have also witnessed stagnant real incomes and/or lower-quality jobs for many people in advanced economies, with a rising number of people in poverty despite being in work, while the wealthy and powerful capture a larger share of the pie. Also, dissatisfaction with various aspects of globalization – tax avoidance and evasion, local blight associated with offshoring or foreign competition, surges in migration, increased market concentration and the emergence of globally dominant firms – has fed a suspicion that the system is rigged to favour the interests of those with money and power, contributed to an erosion of trust in governments in many parts of the world and fuelled protectionism, populism and unilateralism. The multilateral processes in place since World War II have underpinned the growing openness and interconnectedness of our economies. Yet, these same processes have often been unable to respond sufficiently fast or effectively to the challenges posed by globalization. Many people also see multilateral processes as opaque and slow. Some of the recent criticisms of the international, rules-based order are groundless. But the challenge to it is real; it would be foolish to pretend that there is no room for improvement. Despite being the head of an international organisation founded on the principles of openness and cooperation, I readily understand these frustrations. I accept that there have been deficiencies both in how economic globalization has unfolded and with how international institutions have facilitated that. In particular, the insufficient speed of adapting international rules and institutions is a key problem that we are struggling with. 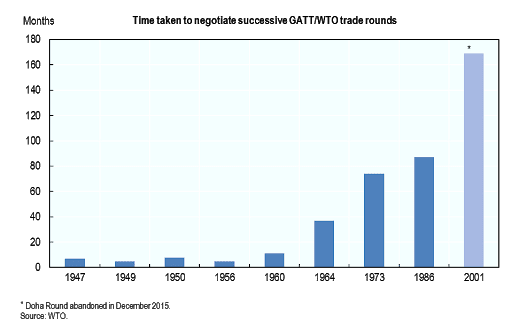 It may be that the pace of multilateral processes was less of a problem decades ago, but now, given the greater interconnections between countries and the faster pace of change, it has become a handicap. We should not forget, however, why the key international institutions were created in the first place and what they have delivered. The bitter experience of the inter-war years, culminating in World War II had shown how a lack of international cooperation could give rise to economic depression and armed conflict. To some extent, we should count the (enormous) success of multilateralism in the number of wars not fought, lives not lost. 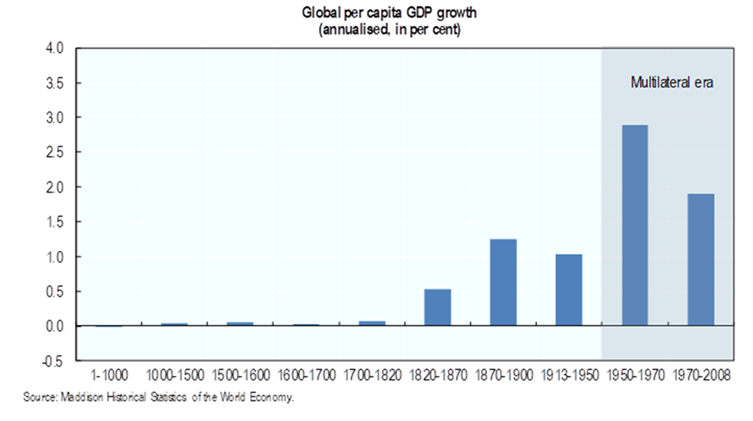 Even in narrower economic terms, it must be remembered what the post-war international system helped to bring about: seven decades of the most rapid sustained global economic growth in history, with hundreds of millions of people lifted out of poverty only in the past 30 years. International cooperation has delivered many other achievements, including the eradication of smallpox via an immunisation campaign led by the World Health Organisation; the reversal, via the Montreal Protocol, of damage to the ozone layer; and the recent OECD/G20 project on base erosion and profit shifting and automatic exchange of tax information to bring about a fairer international tax system that tackles tax avoidance and evasion head-on. All the reasons that underpinned the flourishing of multilateral institutions after World War II remain valid today. International cooperation provides venues to resolve differences peacefully; platforms to agree on common rules of the game; mechanisms to better manage international flows; and channels for exchanging ideas, experiences and practices so that countries learn from each other. Beyond those longstanding rationales, there are new and additional reasons to seek multilateral solutions to economic challenges. Notably, the digital transformation in all our countries does not stop at national borders. Digital companies are “born global”, and the largest of them dominate their market not only domestically but globally. These facts add another dimension to the growing interconnectedness between different national economies. This suggests that uncoordinated national rules and policies will not be effective in achieving their goals. Also, the urgent issue of climate change is perhaps the most important example of the “global commons”, and the cooperative action agreed to date, though welcome, will not be sufficient. More ambition and more follow-through will be needed, and this is only likely to happen via a multilateral approach. International cooperation is therefore more crucial now than ever. But it must be reshaped to answer to people’s current frustrations and criticisms. The OECD has taken seriously the imperative of improving multilateral processes and institutions. At our 2018 Ministerial Council Meeting, chaired by France, we put reshaping multilateralism – to make it more responsible, effective and inclusive – at the center of our agenda. At a moment when the multilateral system is under question, we wanted to remind the world of the many benefits that countries derive from it and the dangers of retreating behind national borders, while also focusing on how to reform it so that it delivers more widely shared gains and better addresses the dark side of the global economy. To achieve this, we think that multilateralism will have to be more inclusive in two ways. First, in the sense of giving influence to a wider range of countries and consulting more thoroughly with stakeholders, including civil society. Second, more attention should be paid to ensuring that the growth yielded by the global economic system is inclusive, both across countries and within them. All international policy initiatives – and domestic ones, too – should have as their goal broad-based increases in people’s well-being. For the OECD, one aspect of the imperative to give adequate voice to regions and countries with growing importance in the global economy is broadening the membership of the organisation. This has been a priority for me during my tenure as secretary-general: since 2006 the membership has increased from 30 to 37. Even more important, however, is engaging with the large emerging economies that do not yet see themselves as ready for OECD membership. We have been working intensively with these countries to bring them into cooperative processes on difficult issues such as corporate taxation, excess steel capacity, responsible business conduct and foreign bribery. They have also increasingly been engaging in our peer review processes, which both benefits them and raises the global relevance of our discussions. The challenge now facing international organizations, of setting and implementing global standards across many areas in an increasingly multi-polar world, is not getting any easier – but we must be equal to the task. Although improving international cooperation is an urgent task, it is equally important to acknowledge that there are always trade-offs between qualities such as national sovereignty, democratic legitimacy, effectiveness and speed of decision-making. In particular, there tends to be a tension between democratic validation and the degree of multilateral action. It may be possible to build more mechanisms of popular consultation and approval into multilateral initiatives, but for the foreseeable future democratic processes will primarily be exercised at the national and sub-national levels.